Greece Library Teen Blog: 10 Reasons why I love Harry Potter books! 10 Reasons why I love Harry Potter books! 1. It's so British. That's important to an Anglophile like me! Especially if you like talking in British accents and need practice. 2. The books appeal to all ages - I read them, my children read them, aloud, to yourself, it doesn't matter - they cross age barriers. 3. You feel for these characters. When I cry because a book character has died, I am connected. How many books make you feel that way? 4. 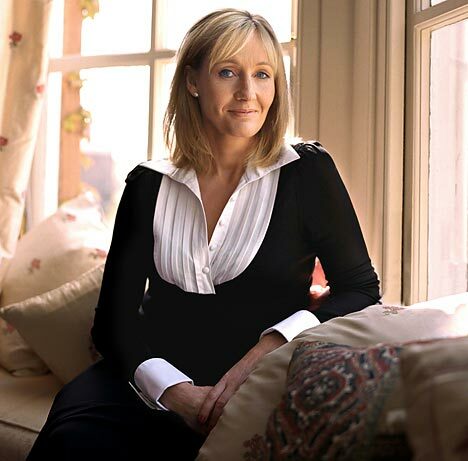 J. K. Rowling's life story summed up in one word: inspiring. Read her biography - now! (We have several here at the Greece Public Library) You won't be sorry, and if you have time, watch her Harvard commencement speech on YouTube. Good stuff! 5. The movies were good, not as good as the books, but really good! For the first time EVER - the director's crawled into my imagination and replicated what I saw there for settings and characters! 6. Mom's are valued. OK, I'm a bit prejudiced here being a mother of three, but how refreshing! 7. The books are re-readable. I've read them each at least three times, and want to read them all again! I don't feel this way about many books, and I've read ALOT of books in my life. 8. They're magical. The books transport you to another world.....Don't you wish you could be a student at Hogwarts for a semester? I do! 9. The nerds win. Harry, Neville, Ron, Hermione; they are not perfect supermodels. They are real, they are flawed, they are......like all of us. 10. Love, the real love of sacrifice, loyalty, and bravery, is the most powerful magic of all. Not the trite, superficial love, the "Oh yes, he's my soul mate TODAY" celebrity driven kind of love. J. K. Rowling, I thank you! Great post! I adore the series, and I especially agree with you about age barriers and re-readability: these books are excellent for everyone, and I would even argue that they SHOULD be re-read. I've picked up so many nuances the second and third times around. Rowling rocks! Thank you Jen and Steph! Winner Week 5: Sarah M.
Winner Week 4 - Amber V.
Winner for Week 3: Rachel W.
Winner for Week 2: Jenny V.
Winner for Week 1: Gabby G.